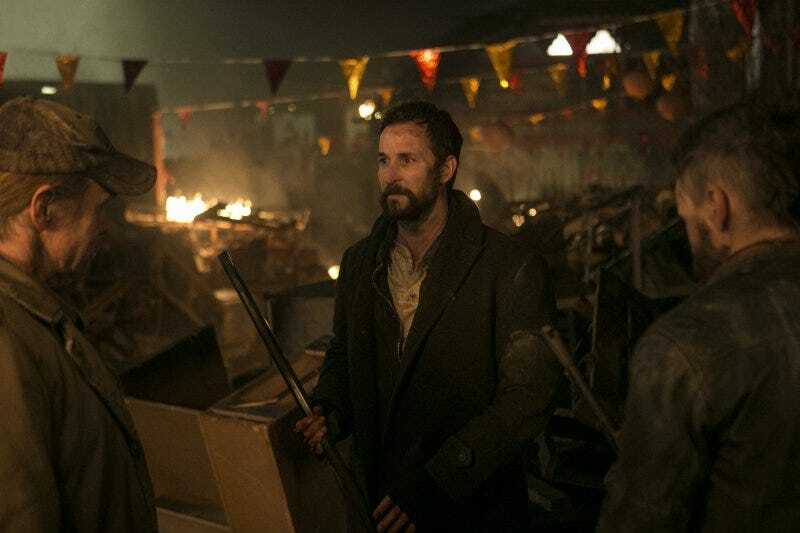 One constant rule about Falling Skies has always seemed to be: Tom Mason is pretty much never wrong, and the Mason family never gets seriously hurt, even if Hal gets eye-bugged and Ben has been harnessed. But that may finally be changing. 1) Tom insists that Lexi hasn't proven to be a threat (even though we know she's a half-alien monster, and she's inside an alien cocoon that usually unleashes a murderous creature when it opens.) He also promises that if Lexi does turn out to be a threat, she will stop her. Somehow. Using lectures about American History, or by threatening to send his daughter to her room. When Lexi does pop out, she doesn't go on a murder spree — and in fact she looks (somewhat disappointingly) just the same as she did before. But she has decided that her loyalties lay with the Espheni, and she's sick of the violent, fearful humans. Actually, everybody gets off pretty easy — when Lexi decides to go off and join her "real" alien family, she only kills one person. Lourdes, who pretty much asks for it. Lexi: I've decided that all humans are evil because a few people got scared when I went into a giant cocoon. I'm leaving now. Lourdes: I'm nothing without you. I was a total mess until you deloused me. Please take me with you. Lexi: Do you want me to "save" you? "Save" obviously in this context meaning kill horribly? Lourdes; Yes, totally. Let's do that. Oh wait, why is the world suddenly blood-flavored? Anyway, Tom blames himself — which he should, since he made promises that he could never have kept, and which no sane person would ever have made. But Anne still thinks Lexi is sweet and innocent, in the face of all the evidence. 2) The Overlord whose face Tom burned off is coming for Tom, now that Lexi has withdrawn her protection. And the advance of this Overlord (who we'll call Overlorde) is pitifully slow — he'll be there in a few hours, or 12 hours if the Volm blow up a bridge (which they do.) There's plenty of time to get away, but Tom decides that since Overlorde will never stop chasing him, they should all make their "last stand" in Lexi's Shangri-La. The battle against the aliens goes surprisingly well — the Mega-Mechs, which used to be impervious to pretty much any weaponry, can be taken out with a bit of thermite now. And a bit of smoke confuses their sensors something grand. Our heroes basically take out a whole battalion, with minimal casualties — until a gas main blows up. Which... confuses me. What gas main? Is there still a gas company someplace supplying gas and power to homes across the Eastern seaboard? Did somebody tell the gas company the apocalypse happened? Anyway, Tom Mason's egomaniacal insistence on ordering all his people to stay and fight kind of blows up in his face, since it winds up costing the life of that nice nuclear scientist/geneticist guy. And Maggie is pinned under a ton of rubble. Tom has kind of a meltdown, realizing at last that he's not really as brilliant a leader as he's been made out to be all this time. He really should have gotten the gas turned off before launching this plan. Of course, at this point, Tom Mason's real superpower — getting other people to sacrifice themselves for him — kicks in, and Tector knocks him out with a wrench and takes his place. Shooting Overlorde, and missing. Poor Tector, dead for no reason. For all that, though, this episode had a very "soundstagey" feeling, with the characters running from one part of a set to the other and acting terrified and sentimental by turns, without a real sense of urgency most of the time. The energy is going out of this show, probably because so much of the storytelling has revolved around the "is my half-alien baby evil" storyline. And a lot of threads, like the "Nazi education camp" and "Skitterized humans" ideas, have sort of led nowhere.